The greatest paradox of the Tour de France is that there is almost as much praise and honour to be accorded to the last placed rider as the first. Thomas Voeckler has set up a fascinating final week by defending his position in the yellow jersey. If the Tour wanted to reset the balance and restore its image, then a win for a vehemently clean, French rider who never rides for second is the full card of big box ticked. That he should note, after the stage to Plateau de Beille, that he wouldn’t have been able to ride like that against Basso and Armstrong in 2004 tells you much about how the sport has changed. I believe that the “contenders” think that they can crack him in the Alps when he finds himself in unknown territory and the high mountains. That belief looks less credible with every day he continues and ignores his brilliant race craft, along with the wider race picture. Voeckler is tough as teak, copes well with expectations and has absolutely nothing to lose at this point. Europcar also has Pierre Rolland sitting in third place in the Maillot Blanc (best young rider) competition. His team boss Jene Rene Bernardeau has been around long enough to have learned every trick in the book. So perhaps he will look to sling Rolland up the road in the Alps, or at least be happy to see Rein Taaramae (Cofidis) or Arnaud Jeannessson (FDJ) go with it. 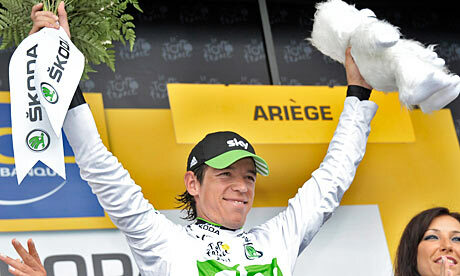 That way he can draw Team Sky into the chase as they will want to defend Rigoberto Uran’s lead in that competition. Colombian Uran, part of Team Sky’s Plan B, has done a very good job of slotting into the lead group, climbing with the best without being forced to lead open the road for them. Matt Rendell, as passionate as a native about the brilliant gem of Colombian cycling, has been warning of his brilliance for some time. The high mountain finishes of the Alpine stages should be to his advantage. What a wonderful revival of the Colombian flame that burned so bright in the 1980s it would be if he could finish inside the top 10 and/or claim the white jersey. Meanwhile his former teammate, Andrey Amador of Movistar, is last in the young rider classification and Lanterne Rouge overall. A heavily bruised ankle notwithstanding he battles on, determined to make Paris. The first rider from Central America (he’s from Costa Rica) to compete in the Tour, he is – to paraphrase Public Enemy – a hero with his face on a stamp. For the full score on him and the Lanterne Rouge, TDF Lanterne Rouge blog has a full profile of him and his stamp. This entry was posted in Tour de France and tagged "Lanterne Rouge", Andrey Amador, Maillot Blanc, Maillot Jaune, Rigotberto Uran, Thomas Voeckler, Tour de France, White Jersey, Yellow Jersey. Bookmark the permalink.